I originally hadn’t signed up for this Autumn’s readathon because I had plans. I had a wisdom tooth out a couple of days ago, though, and it was a bit more complicated than expected so I’m still taking it easy and recovering. What better way to recuperate than with a solid bout of reading?! I won’t be doing the full 24 hours because of the face situation but I’m hoping to still get plenty of hours in around some sleep. I’ll mostly be tweeting this time (@LitAddictedBrit), I think, and updating here every few hours or so. I’m going to focus on the reading and socialising and only do the challenges if they’re easy and won’t take too much prep time. Snapped handily propped in my spot for the day! 2) Which book in your stack are you most looking forward to? I think Dust and Shadow by Lyndsay Faye – it’s a Sherlock Holmes investigates Jack the Ripper story, which just sounds incredible. I read Jane Steele recently and loved Faye’s writing so I have high hopes that this will be another darkly gripping story. 3) Which snack are you most looking forward to? I’ll try not to mention this again but I can’t really snack on anything that isn’t mostly liquid at the moment so I’m mostly looking forward to a coconut latte in the afternoon. Sounds gross but is actually delicious. I brought them back from Malaysia and only have a few left so I save them for relatively special occasions now! 4) Tell us a little something about yourself! I’m a 30 year old book blogger from the UK. I love reading (duh), Fruit Gums and cats. I don’t care for cows or birds (mostly pigeons). 5) If you participated in the last read-a-thon, what’s one thing you’ll do different today? If this is your first read-a-thon, what are you most looking forward to? I’ve done a readathon before but never without any plans for the day so I’m going to make sure I have fewer distractions this time. I’m also going to focus more on Twitter as a means of keeping in touch with everyone because it’s quicker than blog-hopping. Thoughts so far: I’m really pleased that I had a relatively easy ‘book finished’ win in my pile – not only was Bodies of Water written beautifully, it was easy to get lost in. 4 stars, definitely! Thoughts: I don’t know what I was expecting from In a Glass Darkly but it wasn’t an opening story about a man haunted by a ghostly monkey…the writing was quite dense too so maybe not something I’ll be dipping back into as the readathon progresses! I’ve borrowed Miss Peregrine’s Home for Peculiar Children from my mum and I like the idea of writing a story around a series of photographs so I’m looking forward to finally reading it! 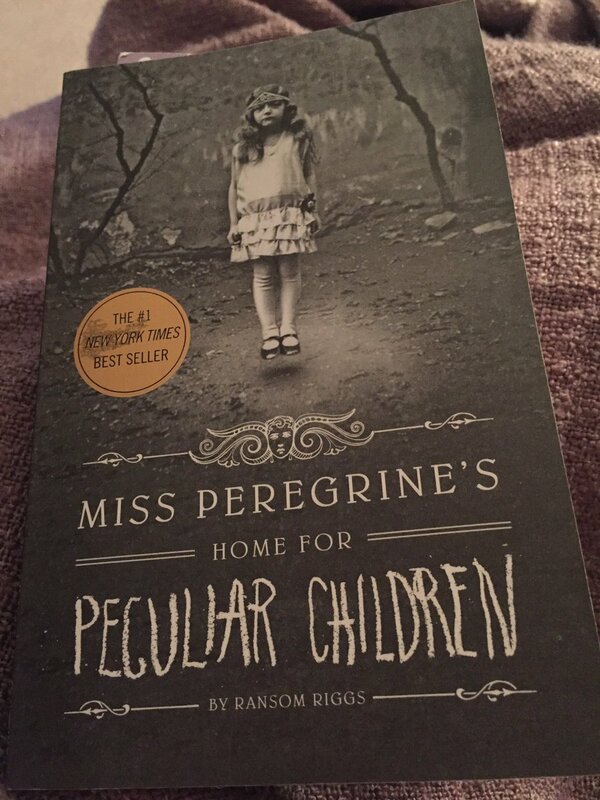 Thoughts: I’m glad I moved on to Miss Peregrine’s… I’ve been curious about it for years and so far I’m really caught up in it. It’s more complex than I imagined, mixing the stories that a grandfather tells his grandson with the true horror stories of the grandfather’s past of a Jewish child during World War II. The pages are flying by and I’m really looking forward to seeing where the story goes. I might not update the blog again tonight but I’ll keep updating on Twitter until I go to bed! Read on, friends! Thoughts: I always planned on sleeping because I haven’t been on top form over the past few days so I’m absolutely fine with having had a decent night’s sleep. Perhaps not very readathon-y but important nonetheless. I’m still enjoying Miss Peregrine and I’m hoping to get it finished before wrap-up time comes! Last few hours now!! Thoughts: Between my update at 9.48am and the UK finish time of 1.00pm, I managed to finish the last 240 or so pages of Miss Peregrine’s Home for Peculiar Children and read the first 50 pages of a Lucy Knisley travelogue, An Age of License. After reading time was up, I participated in Ellie‘s Draw It Out mini-challenge (which is the impressive drawing you can see above) and am finally getting round to wrapping up. I had a really good time with the readathon this year! I think because I knew ahead of time that I wasn’t going to try keeping up with regular updates here or looking through mini challenges and that instead I’d focus on reading and tweeting. 520 pages is meagre by a lot of participants’ standards but to me, it’s pretty damn good and I’m really pleased with it! 1. Which hour was most daunting for you? None were particularly daunting for me because I knew that I was going to be sleeping. I suppose that in a way it was the last hour where I was hoping to finish a book but wasn’t sure if I would. 2. Could you list a few high-interest books that you think could keep a Reader engaged for next year? 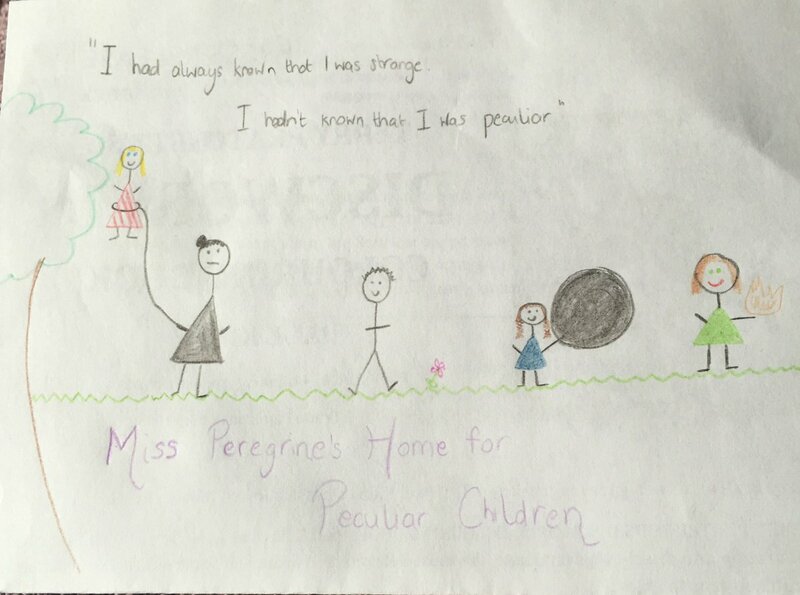 I found Miss Peregrine’s Home for Peculiar Children perfect readathon material. The pictures helped break up the text and kept things interesting, which is always handy if you’re eyes are tiring. Same goes for Illuminae by Amie Kaufman and Jay Kristoff, which is full of neat graphics and different formats that would be great for the early hours when you’re not sure if you can look at many more words. 3. Do you have any suggestions for how to improve the Read-a-thon next season? As always, nope. 4. What do you think worked really well in this year’s Read-a-thon? I may have mentioned this last time I participated too but Twitter seemed particularly chatty this year. 5. How many books did you read? I finished two and I read parts of two others. 6. What were the names of the books you read? I finished Bodies of Water by V. H. Leslie and Miss Peregrine’s Home for Peculiar Children by Ransom Riggs. I also read from In a Glass Darkly by Sheridan le Fanu and An Age of License by Lucy Knisley. 7. Which book did you enjoy most? That’s a tough one. The writing in Bodies of Water was stunning and the story was dark and gothic and perfect for an Autumn afternoon. But then Miss Peregrine’s Home for Peculiar Children had the eery pictures and was a lot of fun so…one of those. I’m bottling out of picking! 8. Which did you enjoy least? In a Glass Darkly. I had originally planned on reading a few of these stories but the writing was dense and the first story was weird (not in a good way – it’s about a man who drinks a lot of green tea and is haunted by a phantom monkey…). I’ll pick it back up but it just really wasn’t right for a readathon. 9. How likely are you to participate in the Read-a-thon again? What role would you be likely to take next time? It will depend on timing a lot for me. I’m getting married on 1st June next year and there’ll be hen dos/stag dos/prep weekends before then. I’ll try, though. If I do, I’ll be a reader again. I’m kind of sad that’s over! If you participated, drop me a link to what you read so I can have a nosey! See you in April, hopefully.